This German monorail will revolutionize rail transportation. At 300 miles per hour it will meet the challenge of the air transport lines. RAILROADS may challenge the increased popularity of air travel by developing a superspeed monorail car. Balanced by gyroscope and controlled by radio, the gyroscope monorail would be capable of more than 300 miles an hour, its inventor claims. The gyroscope, not a modern invention, has only recently been applied to transportation. It steadies ships in storm tossed seas. It aids in the automatic control of airplanes in flight. Applied to rail transportation, the gyroscope will permit much greater speed without sacrificing safety. 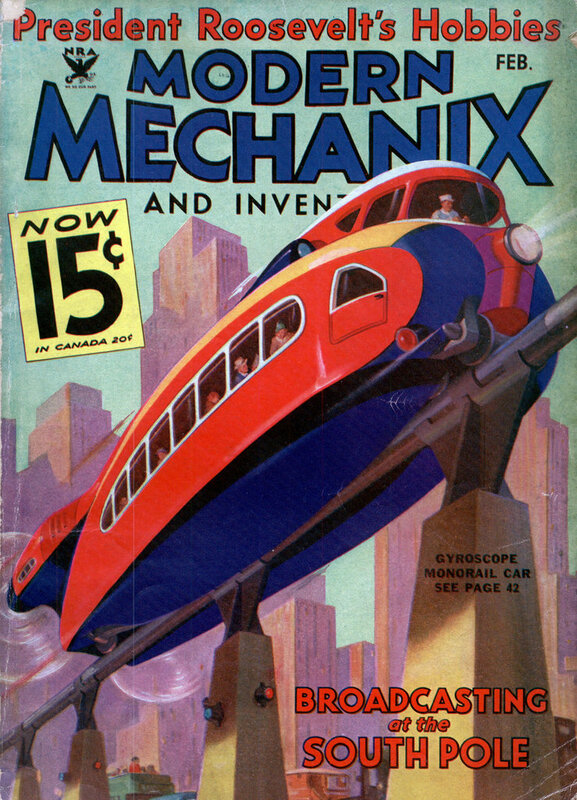 In fact, Raymond C. Buchardt, engineer of the Telefunken company, of Germany, who designed the gyroscope monorail, claims his superspeed car provides greater safety than is now possible. Buchardt’s monorail has all the latest developments in streamlining and makes use of airplane features to guide the car on its single rail. The gyroscope monorail stands upright on its single rail, while present monorails are suspended from the rail. The gyroscopes are used to balance the car on this single rail. They do away with the side sway that would be present were great speeds attempted with the suspended monorail. 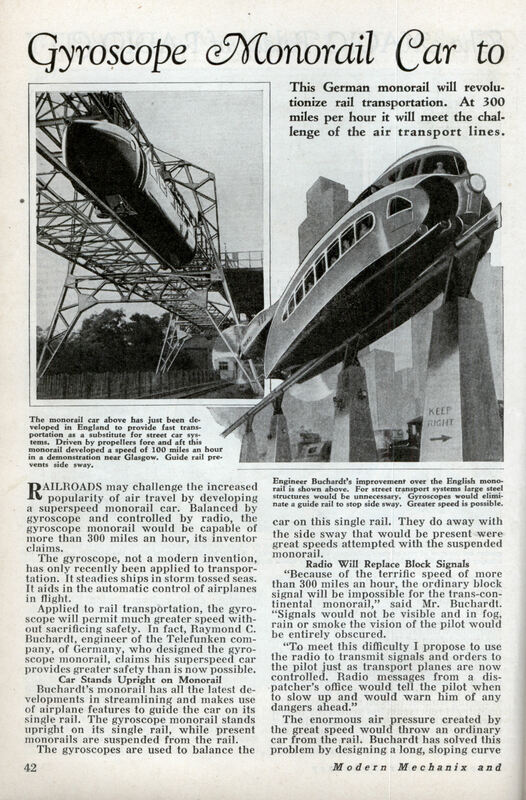 “Because of the terrific speed of more than 300 miles an hour, the ordinary block signal will be impossible for the trans-continental monorail,” said Mr. Buchardt, “Signals would not be visible and in fog, rain or smoke the vision of the pilot would be entirely obscured. The enormous air pressure created by the great speed would throw an ordinary car from the rail. Buchardt has solved this problem by designing a long, sloping curve on either side of the car, which he calls a “wind catcher.” The air pressing against this “wind catcher” would hold the car on the rail. In his experiments with his invention, Buchardt found that the monorail would have trouble taking curves. The car took the curve perfectly, but the centrifugal force nearly threw it off the rail after completing the curve. For that reason stabilizing fins were placed at the front and rear of the car along with a large rudder. The forward fin also houses the radio antenna. The gyroscope car is driven by two large propellers at either side of the rear end of the car. One gyroscope would be housed in the forward end of the car and the other in a rear compartment. Power would be supplied by Diesel engines. The rail used would be round and the wheels curved in such a way as to form a ball link. The traction system type of monorail would be much smaller than the car used in cross country runs. The latter would be a double-decked car with the pilot housed in a third deck forward. The trans-continental type would carry approximately 100 passengers. What was with people’s obsession with monorails? I don’t think any single system has been widely adapted or installed.